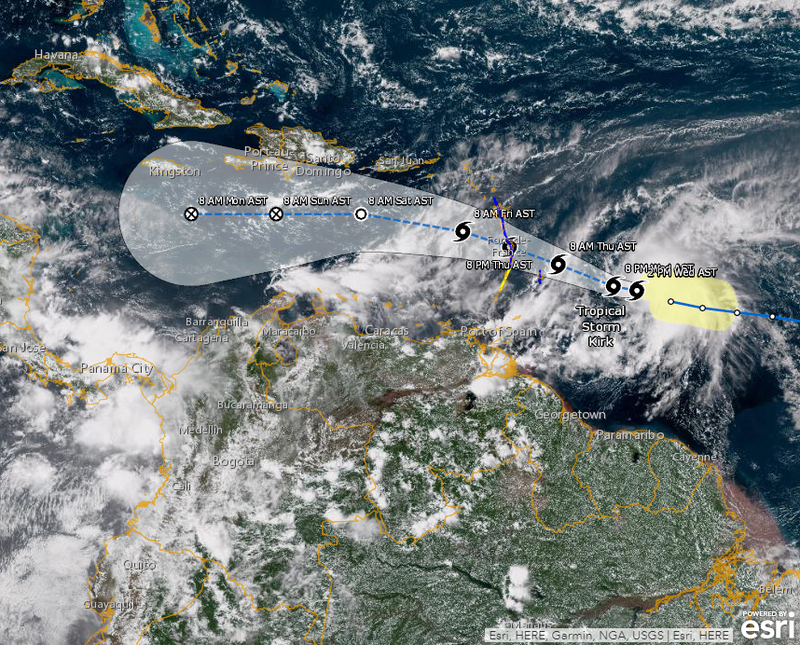 According to the NHC's 5 p.m. EDT advisory, Kirk was located about 260 miles east of Barbados and about 380 miles east-southeast of Martinique, moving west-northwest at about 18 mph. The storm is packing maximum sustained winds of 60 mph with tropical storm-force winds reaching outward up to 115 miles from the center. NHC's forecast says the center of Kirk will move over the Lesser Antilles by Thursday afternoon. In the Pacific coast, weather officials are monitoring Hurricane Rosa. Forecasters said it is expected to strengthen but doesn't pose an immediate threat to land. NHC said a tropical storm watch is in effect for St. Vincent and the Grenadines -- with tropical storm conditions appearing within the next 36 hours. NHC says Kirk can produce total rainfall of 4 to 6 inches across the northern Windward and southern Leeward Islands -- with isolated maximum totals up to 10 inches across Martinique and Dominica. They warn of life-threatening flash floods and mudslides. Economic research firm Moody's Analytics estimated that the storm has caused around $44 billion in damage and lost output, one of the 10 costliest hurricanes to hit the U.S. The worst disaster, Hurricane Katrina in 2005, cost $192.2 billion in today's dollars. Last year's Hurricane Harvey cost $133.5 billion.